Hoary-headed grebes feed mainly on arthropods (insects, crustaceans and arachnids) rather than fish. They take a wide variety of prey and so can utilise those that appear in temporary waters. Foraging is mainly by deep diving and feeding on the bottom. They are the most gregarious of grebes forming groups and large flocks. In non-breeding plumage the two small grebes in our area (Hoary-headed and Australasian) can be hard to tell apart and good views are needed to be certain. The Australasian has a golden iris, the dark cap does nor extend below eye-level and the bare yellow spot at the gape is visible but very pale. The iris of the Hoary-headed Grebe is unusual having a central dark ring with concentric lighter inner and outer rings. The cap extends below the eyes and there is no bare skin at the gape. Other clues are provided by the habitat – Australasian Grebes are normally found on small freshwater bodies of water; Hoary-heads on larger water bodies which may be brackish or saline – and by behaviour – Australasian Grebes are found in small parties close to the shoreline; Hoary-heads in larger groups on open water. Breeding occurs after the rains and so varies from season to season, but generally occurs from October to January. They nest colonially and each nest is a small floating platform of aquatic plants loosely attached to submerged vegetation. The clutch size usually varies from 3 to 5 eggs. Hoary-headed Grebes are monotypic having no subspecies (Poliocephalus poliocephalus -Jardine & Selby, 1827). Males and females are alike except the male is slightly larger and longer-billed. The breeding adult has a distinctive head with narrow, silvery plumes on the head and face giving a ‘hairy’ impression. A characteristic white line extends from the base of the mandible to just below the eyes. The nape, upperparts and wings are brownish-grey with a white trailing edge to the secondaries and innermost primaries. The outermost primaries are blackish and the underwing coverts white. The underparts are a dull buff to fawn-brown, lighter on the chin and darker on the flanks. The abdomen is creamy-white with a fluffy ‘bum’. The iris has a central dark ring with lighter inner and outer rings. The bill is blackish with an ivory-coloured tip and the legs are olive to dark grey. 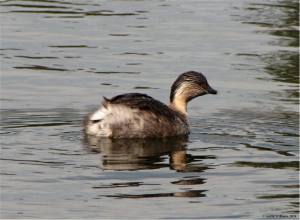 Non-breeding adults look very similar to non-breeding Australasian Grebes. They have a dark cap extending below the eye and a pale face and neck. The rest of the body is like that of the breeding plumage. Juveniles are like non-breeding adults but retain the striped head and neck of the chick. They have a broad white supercilium in contrast to the narrow supercilium of juvenile Australasian Grebes. The chicks have light brown down with blackish stripes, paler below. Hoary-headed Grebes are moderately common throughout South Australia in suitable habitats. They like open, unsheltered wetlands. While being more common on large bodies of fresh water they may also be found on saline or brackish waters in bays, estuaries, creeks and inlets, particularly in winter. They will also use temporary wetlands formed by heavy rains, and small farm pools and dams. They avoid waters covered in water weeds. They are highly dispersive in arid areas, moving into temporary swamps in large numbers, and leaving when these dry up. There is a more or less regular movement towards the coast or perennial inland lakes during winter.